Eric Williams was born in Paterson, New Jersey. Eric was the black sheep of his family. His mother would tell him that he was born bad. Eventually Eric became a gambler and joined the Maggia and moved to Las Vegas. Through his Maggia contacts, he contacted the Tinkerer who provided him with his scythe weapon, which was further enhanced by Ultron with coma-inducing abilities. Taking the name “Grim Reaper,” he became a professional criminal and defeated the Avengers Hawkeye, Goliath, and the Wasp, placing them in comas, but was beaten by the surprise appearance of the Black Panther. Related Dork Side Toys links: Marvel Legends Tigershark, All Marvel Legends, Newly Listed Hulkbuster Series Avengers Wave. Read on to see all of the photos. These are extremely high resolution (and watermark free) images, to see the full resolution, open them in a new tab or save them to your desktop. Official Hasbro Marvel Legends pics from Toy Fair 2015. Check out the Ant Man 3.75″ Figures, Ant Man 6″ Figures Legends and Titan Heroes from Hasbro’s Toy Fair 2015 Event. These include both movie and comic series figures. Here’s the Hasbro Marvel display from Wednesday at San Diego Comic-Con 2014. These include Marvel Legends Infinite Series, including a new announcement on Avengers and Spider-Man (no figures shown yet) under the ML Infinite Series banner. There also some Marvel Infinite Series 3.75″ figures on display. Expect new reveals as the show goes on. Be sure to start hitting up your local stores. Happy hunting! Read on to see the pics. 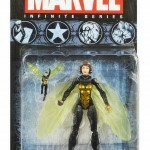 Hasbro has released new packaging shots of the upcoming Avengers themed Infinite wave of 3.75 figures. The packaging is simplified with a large Marvel logo and the Infinite Series title underneath, along with circle icons of the core Avengers figures under that. Included are Captain America, Grim Reaper, Hulk, Hyperion, Iron Man, and Wasp. Check out the high res pics after the break! Right Click and select View or Save Image to see the full resolution pic.